London-based Spencer Ogden’s new offices reflect its sophisticated yet funky brand. Energy, engineering and infrastructure recruitment specialist Spencer Ogden engaged Office Principles for the job of creating a sophisticated and funky branded office, which embodied its evolution as a company. The company felt that it had grown up as a business and needed an office space that reflected its changing profile and which also met today’s needs. It had seen outstanding growth in recent years, including the achievement of global revenue of £100 million in 2017. Office Principles completed the work on Spencer Ogden’s new offices within eight weeks. Image courtesy of Spencer Ogden. The new office features British design flourishes, including the Union Jack. Image courtesy of Spencer Ogden. What is average daily population? What other kind of support space or amenity spaces are provided? This new office embodies Spencer Ogden’s changing profile aimed at meeting modern needs. Image courtesy of Spencer Ogden. What is the project’s location and proximity to public transportation and/or other amenities? 24 King William Street is a brand new building on the cusp of the city’s hustle and bustle, with amazing views, close to the quirky Borough Market and its surrounds. The location is more central than the previous office and most people have saved time on the commute. Each person’s commute was checked to ensure that the transition was as easy as possible for the majority. Was the C-suite involved in the project planning and design process? If so, how? Yes, the C-suite were involved from the beginning. Specifically, in choosing the office space and signing off the final design. The search for new office space was very detailed and the client looked at over 100 spaces and viewed over 35 buildings. They believe that the office space that they secured at 24 King William Street represents who they are now as a business – sophisticated but funky! We started by suggesting a number of different design ideas and concepts. These were presented to Spencer Ogden in the form of presentations / images to provide a discussion point and to decide whether the concepts would work for Spencer Ogden. Spencer Ogden had a pretty good idea about the design they wanted from the start. They already have a number of offices around the world and they each follow a similar design principle. AstroTurf features heavily into the design of the office’s agile workspace. Image courtesy of Spencer Ogden. Spencer Ogden tends to employ a younger workforce due to the activities that they carry out. It was important to create a fun workspace that would appeal to a younger generation. Were there any other kind of employee engagement activities? Employee engagement was really important to Spencer Ogden to ensure that employees were included on the journey and bought into the concept of the relocation. The client carried out regular staff surveys, asking employees about what they wanted from the new office to ensure that each member of the team felt like they had a say and felt empowered. Employees were kept up to date with progress via a number of communications prior to the office move. Spencer Ogden created a brochure which described the benefits of the new office space, including new facilities within the building, all the gyms within 10 minutes’ walk, nearby leisure facilities, including food and drink, points of interest and transport links. 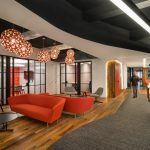 Computer generated visuals of the new office space and photos of the building were included to help employees get excited about the office relocation and to help them make the transition to the new space as easy as possible. Were any change management initiatives employed? The client owned this part of the process (see above) and canvassed the opinions of all staff, informing and updating them as the project progressed. The office was handed over at mid-day and the staff were brought across in the afternoon to immediately view the space, followed by a party for all. Natural light floods into spaces like this one at Spencer Ogden’s new offices. Image courtesy of Spencer Ogden. Given the central location and the major roadworks that were underway on those roads closest to the building, we were presented with specific logistical challenges in terms of gaining access for vehicles and getting materials and heavier products into the building. Given that, with careful planning we were still able to deliver ahead of schedule. Was there any emphasis or requirements on programming for health and wellbeing initiatives for employees? The new building has shower facilities, bike racks and an urban garden; the new space demonstrates a keen desire to nurture and promote its inhabitants’ wellbeing, while providing the company with a bigger space to accommodate its consistent growth and to allow for a more agile style of working. Were there any special or unusual construction materials or techniques employed in the project? The AstroTurf flooring is the stand out product in this office design. It’s a trademark that can be seen in all the Spencer Ogden offices across the globe. AstroTurf is one of the branding elements used in all of Spencer Ogden’s offices. Image courtesy of Spencer Ogden. For specific examples, please describe the product, how it was used, and if it solved any specific problem. The AstroTurf was used at various points throughout the space, dominating overall but with other flooring strategically placed to maximize the impact and provide some contrast. What products or service solutions are making the biggest impact in your space? Again, the AstroTurf stands as the major point of reference as it is common to all of Spencer Ogden’s offices and now helps to identify the brand. Added to that, each office contains objects that directly reference that office’s location so in this office we included quirky and eye-catching pictures and items that represent England, being British and London. Office Principles was tasked with creating an office that reflected a “New York Loft Style.” The office design incorporates modern architecture with the trademark Spencer Ogden AstroTurf flooring. The space also boasts a diner-style kitchen, London telephone booths, and original British artwork. The Spencer Ogden brand is the same globally. It’s instantly recognizable. You can walk into any of their offices and know that it is a Spencer Ogden office. This office absolutely represents the brand, with an uplift in functionality. It’s an engaging, interesting workplace that promotes an active work environment for the staff. The diner-style kitchen is another playful aspect of the design of Spencer Ogden’s offices. Image courtesy of Spencer Ogden. One room at Spencer Ogden is its What Room. It’s an informal meeting area, which has stadium seating, AstroTurf on the floor and you can write on the walls. It can be used for collaborative meetings or just for a quick chat. Some of the guys have used it for a film screening. It’s used for presentations, training and idea sharing. It really embodies the Spencer Ogden brand of being a fun and interesting place to work. Are there any furnishings or spaces specifically included to promote wellness/wellbeing? The desking structure has been rearranged so that the teams can work together on an open floor rather than in separate areas. Agile working areas have been introduced so there’s an opportunity to leave your desk and choose a different space for an important phone call or a paper that you need to write. There’s also a breakout area so the staff can separate work and play. It means that there is somewhere to have lunch and play ping-pong, play the PlayStation and just simply get away from your desks for a little while. There was a great deal of internal communications and Spencer Ogden produced an introductory brochure for staff so that they would all be au fait with the new building, its facilities and other nearby facilities. Previous articleWhere Is the Workplace Headed?